Storytelling aficionado and inquisitive host Eugene Mirman (Bob’s Burgers) sits down with special comedian guests and pauses their true, entertaining, and personal stories to get the funny details they might have left out. 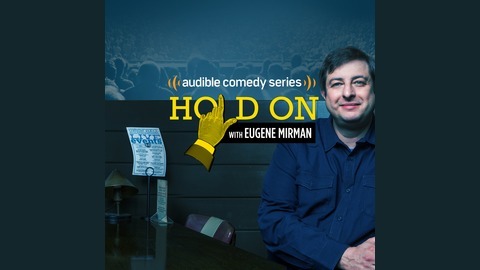 Maybe you couldn't make it to Portland for the 2017 Bridgetown Comedy Festival, but now, with the help of modern technology, you can have a virtual simulation of being in the audience for a live episode of Hold On with Eugene Mirman from that very festival. Marvel at Guy Branum's sassy story of unsuccessful sexcapades, be star struck by Karen Kilgariff's celebrity encounter, bask in the inglorious origin of Kyle Kinane's comedy career, and weep with joy as Eugene Mirman asks all the questions he can about these funny stories - all from the comfort of wherever you are when you tune in! 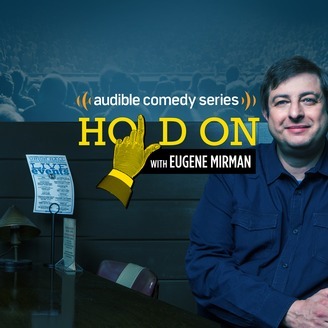 In each episode of the Audible Comedy series Hold On, host Eugene Mirman (Bob's Burgers) pauses the funny stories of comedians and performers to get the skinny behind the story. Featured and future guests include: Jim Gaffigan, "Weird Al" Yankovic, Lisa Lampanelli, Mike Birbiglia, Reggie Watts, Kumail Nanjiani, Maria Bamford, Hasan Minhaj, Chris Gethard, Gad Elmaleh, Joe Mande, Cameron Esposito, and more! Enjoy new episodes weekly on Audible.